CLICK HERE for notice regarding for M.P.Ed. Admission 2018. CLICK HERE for notice regarding D.Phil Admission 2018. CLICK HERE for M.P.Ed. Admission 2018. CLICK HERE for notice regarding M.P.Ed. Admission 2018. CLICK HERE for notice on Fitness Test (1000 meter run or walk). CLICK HERE for notice on Fitness Test (50 meter sprint). CLICK HERE for notice on Fitness Test (Overhead back throw). CLICK HERE for notice on Fitness Test (Standing board jump). 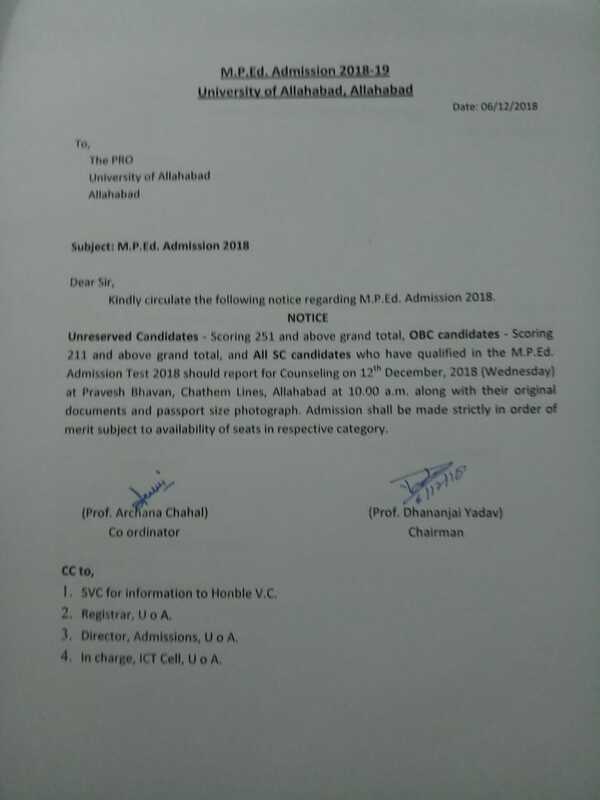 CLICK HERE for notice on Fitness Test for admission to M.P.Ed..
CLICK HERE for counselling or visit website www.auadmissions.org. 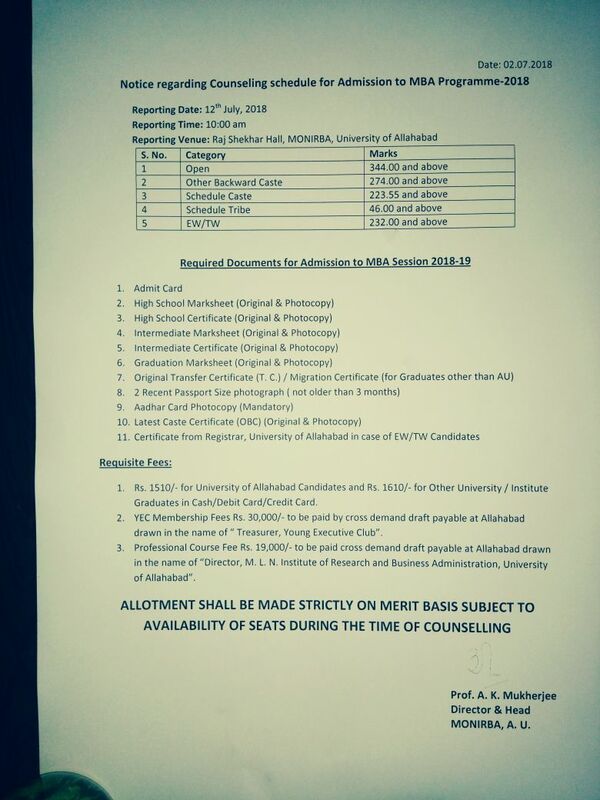 CLICK HERE	to download the notification regarding the counselling for admission to B.A. LL.B. and LL.B. Courses. CLICK HERE	to download the notification regarding the practical test for admission to B.P.A. (Music). CLICK HERE	to download the notification for B.Ed. Admission at S.S. Khanna Girls Degree College. CLICK HERE	to download the notification for Practicals exam for admission to BFA. CLICK HERE	to download the notification for counselling for Admission to MBA at MONIRBA. PGAT Score Card is available for Download. Please login to download your scorecard. PGAT-ⅠⅠ Score Card is available for Download. Please login to download your scorecard. MBA/MBA(RD) Score Card is available for Download. Please login to check eligibility for counselling. CLICK HERE	to download notification regarding B.ED counselling. Venue: MOBIRBA, Chaitham Lines Campus,University of Allahabad, Allahabad. CRET Score Card is available for Download. Please login to download your scorecard. Notice : MBA/MBA(RD) Admission Test 2018 Score Card is available for Download. Please login to download your scorecard. Notice : UGAT(B.A.,B.Com, Bsc(Home Science) ,Bsc(Maths) and Bsc(Bio)) Admission Test 2018 Score Card is available for Download. Please login to download your scorecard. Notice : IPS Score Card is available for Download. Please login to download your scorecard. Notice : LL.M. Score Card is available for Download. Please login to download your scorecard. Notice : LL.B. Score Card is available for Download. Please login to download your scorecard. Notice : B.Ed. Score Card is available for Download. Please login to download your scorecard. Notice : M.Ed. Score Card is available for Download. Please login to download your scorecard. Notice : B.A.LL.B Score Card is available for Download. Please login to download your scorecard. 1. PGAT-Ⅰ Admit Card is available for Download. Please login to download your Admit card. 2. PGAT-ⅠⅠ Admit Card is available for Download. Please login to download your Admit card. 3. LL.M Admit Card is available for Download. Please login to download your Admit card. 5. The last date of filling the online application form for M.PEd-2018 is being extended till 22nd may, 2018. The Admit cards may be downloaded from 28th may,2018. 6. LL.B Admit Card is available for Download. Please login to download your Admit card. 7. IPS Admit Card is available for Download. Please login to download your Admit card. 8. UGAT Admit Card is available for Download. Please login to download your Admit card. 9. B.A.LL.B Score Card is available for Download. Please login to download your scorecard. 10. Due to IIT-JEE examinations, the UGAT examinations which was earlier scheduled for 20/05/2018,is now resheduled on 21/05/2018 at the same time. 11. 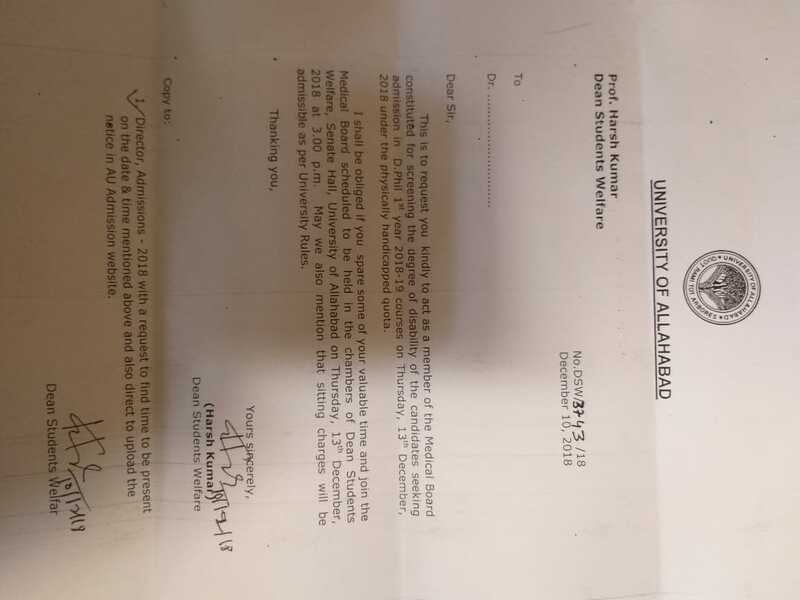 All the candidates willing to apply for the entrance examination for admission to various courses of the University of Allahabad for the session 2018-19 are advised that they should only consult the websites https://www.auadmissions.com and http://www.allduniv.ac.in for registration/application purposes. No other website is the authentic website for this purpose.Any news/Updated information regarding the admission process/dates etc. will be available only through these websites. Click Here for Admission in B.A.LL.B Course Download Information brochure for B.A.LL.B Course Score Card is available for Download. Please login to download your scorecard. Click Here for Admission in for MBA/MBA(RD) Course Download Information brochure for MBA/MBA(RD)Courses Score Card is available for Download. Please login to download your scorecard. Click Here for Admission in B.Ed Course Download Information brochure for B.Ed Course Score Card is available for Download. Please login to download your scorecard. Click Here for Admission in for M.ED. Course Download Information brochure for M.ED. Course Score Card is available for Download. Please login to download your scorecard. Click Here for Admission in UGAT Course Download Information brochure for UGAT Courses UGAT(B.A.,B.Com, Bsc(Home Science) ,Bsc(Maths) and Bsc(Bio)) Admission Test 2018 Score Card is available for Download. Please login to download your scorecard. Click Here for Admission in LL.B Course Download Information brochure for LL.B Course Score Card is available for Download. Please login to download your scorecard. (Computer Applications/(Food Technology/ Nutritional) / Media Studies/Fashion Design) Score Card is available for Download. Please login to download your scorecard. Click Here for Admission in PGAT-I COURSES Download Information Brochure for admission to PGAT-I Score Card is available for Download. Please login to download your scorecard. Courses available for Specialized / Non-conventional subjects Score Card is available for Download. Please login to download your scorecard. Click Here for Admission in For LL.M Course Download Information brochure for LL.M Course Score Card is available for Download. Please login to download your scorecard. Click Here for Admission in CRET Courses Download Information brochure for CRET Courses Score Card is available for download. Please login to download your scorecard.